Glass Has Ancient Origins But A High-Tech Future Where would the smartphone be without glass? Now glass may change the way you interact with data again — in everything from head-up displays on car windshields to augmented-reality glasses. 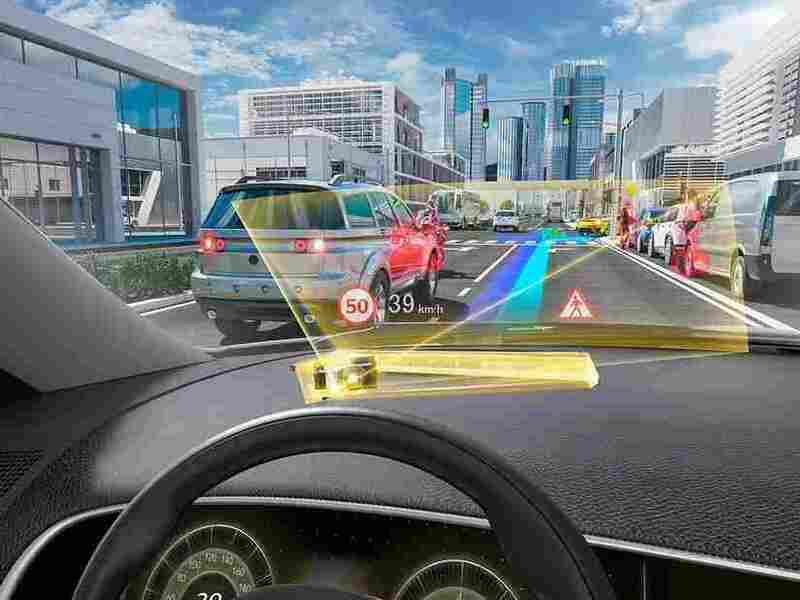 DigiLens is working on a new kind of head-up display for cars that would turn a driver's windshield into a screen. The idea is to make the images appear as if they're in the real world. The future of how you interact with computers depends on a technology that's more than 3,000 years old. It's a technology you already use every day, on your smartphone, your TV, in your home, your car and most likely at work. It's even in the wires that bring you Internet service at near-light speed. Some people believe the impact glass has on our lives is only getting started. Karol Wight is one of them. She meets me in the lobby of the Corning Museum of Glass, in Corning, N.Y., and leads me to a gallery room full of light and sculptured glass. 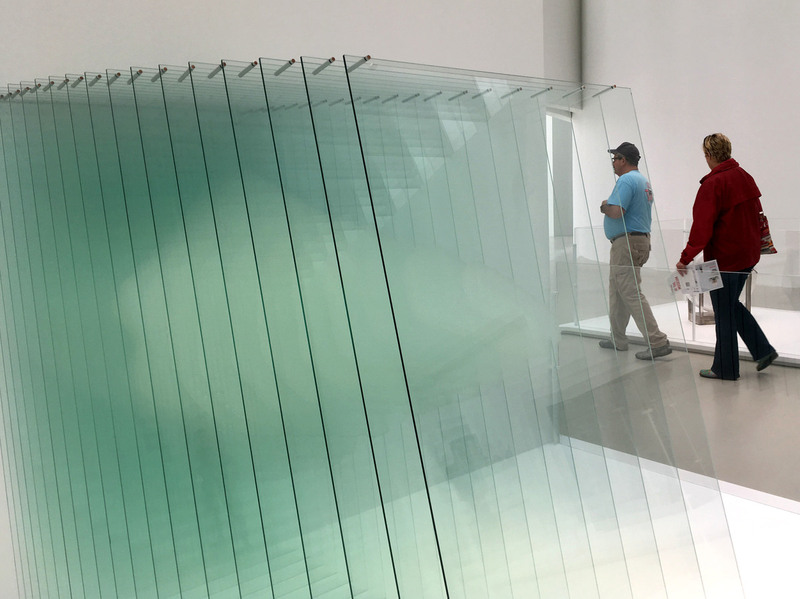 An artwork called Sheer Volume, by Michael Scheiner, is displayed at the Corning Museum of Glass in Corning, N.Y.
She has a Ph.D. in art history, focused on the ancient origins of glass. She remembers how she first got interested in a material so many people overlook. "The more I did the research, and the more I understood glass is a very ancient material, I just fell in love with it," Wight says. "And I never turned back." Now, Wight leads the Corning Museum of Glass, which is about a lot more than art. The museum was started by Corning, the company. You might know it from the cookware it developed years ago, CorningWare and Pyrex. But Corning has been at the center of a lot of important products. It made the glass for Thomas Edison's light bulbs. It made glass for the cathode ray tubes in TVs. It made the glass for mirrors in the Hubble telescope. And, more recently, it's Corning's glass that made the iPhone touch screen possible. For the past few years, Corning has been trying to push a new idea. That glass isn't just an important product, it's actually the defining material of our time. Corning calls it The Glass Age. "Yes, this is the glass age," declares one video produced by Corning. "But it's only just begun. Its potential is barely tapped." And what's next in this glass age? Touch screens, everywhere: your walls, your car, the mirror in the dressing room at the mall. Windows that can be programmed to let in exactly the amount of light that you want. And more fiber optic cables, which are actually made up of extremely thin strands of glass. It's not just folks in Corning, N.Y., who believe glass has a lot of potential for the future. Chris Pickett is CEO of a Silicon Valley-based company called DigiLens. He wants to change the way information reaches your eyes. "So we make thin, transparent, holographic waveguide displays," Pickett explains. What that means is the displays are like a computer screen, but see-through, just like in a sci-fi movie. DigiLens already has displays in jets. It's working on a new kind of head-up display for cars that would turn a driver's windshield into a screen. "And they see that information and it doesn't look like it's reflecting off the windshield," Pickett says. "It actually looks like it's out at some distance." Pickett says the idea is to make the images appear as if they're in the real world, so there's less distraction to look away from the road. DigiLens is also one of a number of companies that's trying to use glass to do the same augmented reality approach for actual glasses that people can wear. Think Google Glass, but hopefully better this time around. "It's going to fundamentally change the way people see and interact with data and images," Pickett says. "And that is going to be huge." So what's standing in the way of glass? Well, for one, no one's really sure those weird-looking augmented reality glasses will take off. And those other futuristic ideas for glass, they need some work too. And there is another rival on the scene, one with some admirable traits. Plastic bends. It even folds. It doesn't break like glass. It also isn't as clear for displays, and it can be scratched. But glass has been around a lot longer. And it has some big supporters looking to the future.